In this chapter, we provide general information on three essential elements of the environment in which our three problems are embedded. These elements are multi-project management, multi-skilled workers, and teamwork. In Section 2.1, we elaborate on multiproject management, which is concerned with managing a portfolio of parallel undertakings. 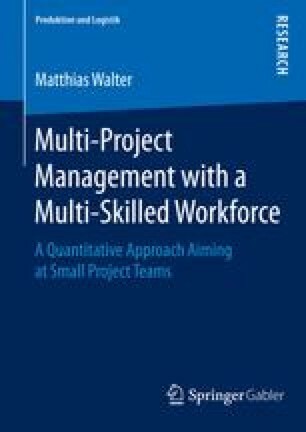 We emphasize the importance of multi-project management, explain its main tasks, and give an overview of contributions that address the main tasks. Two of these main tasks, namely, project selection and staffing, are part of our approach. In Section 2.2, we turn to multi-skilled workers.